This production opened on August 17, 2016 and closed on August 21, 2016. “Oh, the thinks you can think” when Dr. Seuss’ best-loved characters collide and cavort in an unforgettable musical caper! Horton the Elephant, the Cat in the Hat and all of your favorite Dr. Seuss characters spring to life onstage in Seussical JR., a fantastical musical extravaganza. 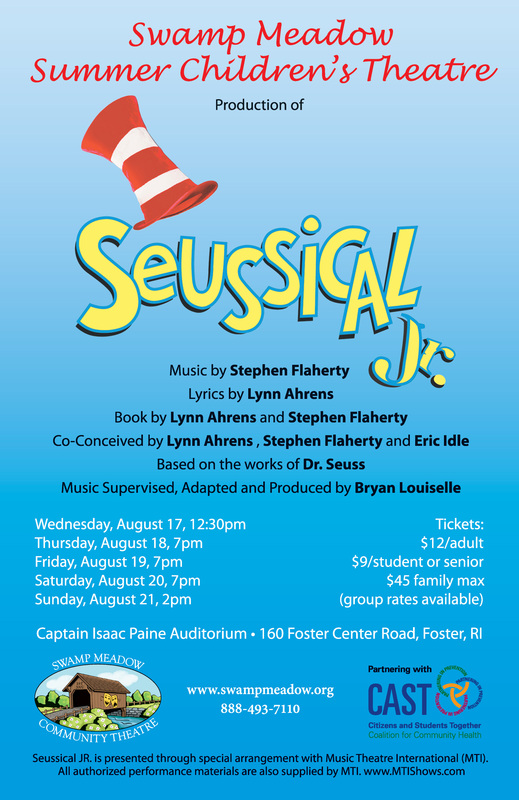 We will be presenting Seussical JR as our Summer Children’s Theatre production August 17th at 12pm, August 18th, 19th and 20th at 7pm, and August 21st at 2pm. All performances will be at Captain Isaac Paine Elementary School in Foster, Rhode Island.